Marine NOx, SOx, CO2 & Fuel Consumption - Website of marpol-annex-vi! 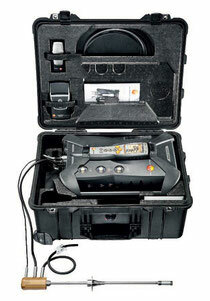 you can use the portable 350-Maritime emissions analyzer that has Type Approval certificate for compliance with MARPOL 73/78 Annex VI, NOx Technical Code and MEPC.103(49), which gives you quickly and efficiently highest accuracy reliable emission measurements that ensure the precise values of O2, CO, NOx, SOx, CO2, flue gas temperature, ambient temperature, pressure, calculated fuel moisture content, and combustion efficiency, in a few minutes, allowing optimum adjustment, data storage/export/printing and thus eliminating guesswork. Optimize diesel engine performance for maintenance and fuel consumption benefits without exceeding NOx limits and be in a position to know voyage costs with a user friendly portable approved system and methods. How? 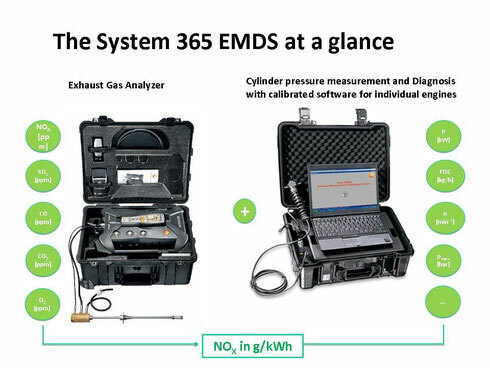 With the unique revolutionary system certified for compliance with revised MARPOL Annex VI & NOx Technical Code by Germanischer Lloyd, the 365 EMDS (Emission Measurement & Diagnosis System) which combines highly-developed hardware and proven concept software. The 2 probe set consists of a cylinder pressure measurement system and a portable emissions analyzer, the first and only emissions analyzer with marine type approvals (GL, DNV, RR). If the engine data is known, the system can define all parameters necessary for the calculation, and with the help of the intelligent software convert the specific NOx values into g/kWh. Furthermore the 365 EMDS includes a precise cylinder pressure measurement system which functions without a Top Dead Centre decoder and performance pressure recording, making it very robust and simple. Via a diagnosis function, it provides measurement data on the engine settings, the status of the cylinders and subsystems, and gives useful tips on the optimum setting and maintenance of the entire engine system. This results in a considerable potential for fuel savings. In addition to this, malfunctions in the engine system can be recognized early and eliminated before reaching a critical stage, or cost-intensive repairs (possibly even at sea), become necessary. 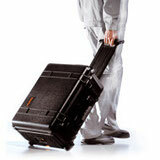 You can lower operating costs and protect the environment with the 365 EMDS system. The unique portable measuring systems with certified measurement technology according to MARPOL Annex VI for NOx in g/kWh, O2, SO2, CO2 and engine diagnosis, can be used for any main and auxiliary diesel engine on board. Fast and substantiated measurements during operation with only 2 probes. No installation necessary or interference with existing infrastructure. Performance information provided is equivalent (concerning accuracy) to the following systems:Torque meter, Flow meter, Conventional cylinder pressure indicating equipment, TDC markers or encoders. Provides embedded simulator to define the optimum operating operating point of the engine. Providing measurements and a simulator for SEEMP (Ship Energy Efficiency Management Plan) with least possible investment cost. Your company will be ready for future forthcoming regulationsand requirements.